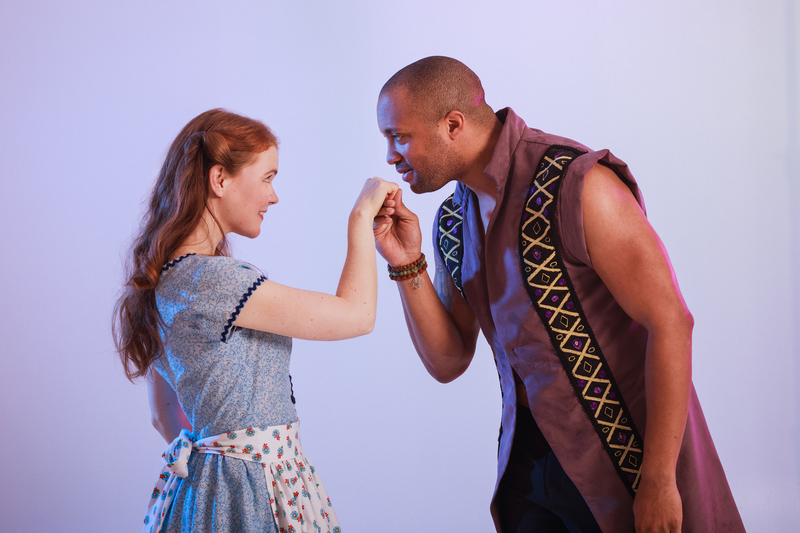 Rogers and Hammerstein’s Cinderella is no Disney fairy tale — in this version, the prince is a dragon slayer who cares about the poor citizens of his kingdom, Cinderella is an activist, and one of the stepsisters turns out to have a heart of gold. There are also two balls that Cinderella (Mallory James) attends and runs away from at midnight. Another refreshing change is her decision to leave her glass slipper behind when she leaves the second ball. She wants to Prince Topher (Tré Cotten) to be able to find her. This Cinderella is political. There are many references to world leaders, revolutions, and the power of the people. For example, Cinderella comments that the prince can’t be a world leader because he seems to have a kind heart and sound mind. Jean Michel (Daniel Curalli), Cinderella’s friend who is fighting for change, rallies the people in his community, falls in love with stepsister Gabrielle (Vanessa Merenda), and ends up running for Prime Minister. The set features a giant clock reminding us that Cinderella’s time is limited, and the horses, pumpkin carriage, and other magical transformations were creatively executed, if a bit clunky. The large ensemble dance numbers are smooth and flashy, especially “The Prince if Giving a Ball,” and Cinderella’s solos held the audience rapt. Her duets with the prince filled Malkin Bowl but cheesy lines such as “We’ve met before and we’re seeing each other for the first time” brought back a bit of the Disney flavour. Another standout performance is Michael Wild as Sebastian, the prince’s manipulative advisor. He, along with Cinderella’s stepmother, perpetuates the corruption that created the unrest in the kingdom. His disingenuous smirks and over-the-top gestures were delightful. Fresh, fun, and familiar, this production isn’t life-changing, but it’s an entertaining night spent under the stars. Out of the two productions in Malkin Bowl this summer, 42nd Street is my pick. This classic musical has charming characters, rousing songs, and dancing that will have you tapping your feet long after the last notes. It’s 1933 in the 42nd Street Theatre, and Julian Marsh (Andrew Cownden) is holding auditions for the ensemble of Pretty Lady. “You’re on your way to glory and 32 bucks a week!” he tells them. Bright-eyed Peggy Sawyer (Paige Fraser) from Allentown, Pennsylvania shows up too late to audition and she is crushed. Billy Lawlor (Blake Sartin) steps in to save the day (and try to get a date) by telling Peggy he can help her still get an audition. Fraser shines as the naïve small-town girl about to catch her big break, Cownden channels Marsh’s ego and unrestrained fervour perfectly, and Janet Gigliotti is stunning in the role of Dorothy Brock, an older star who is on her way out but receives the leading role thanks to the financial backing of her sugar daddy, Abner Dillon (Tyler Q. Felbel). Complicating matters is her lover, Pat Denning (Matthias Falvai), who sneaks into her dressing room and is forced to flee town after threats are made on his life. 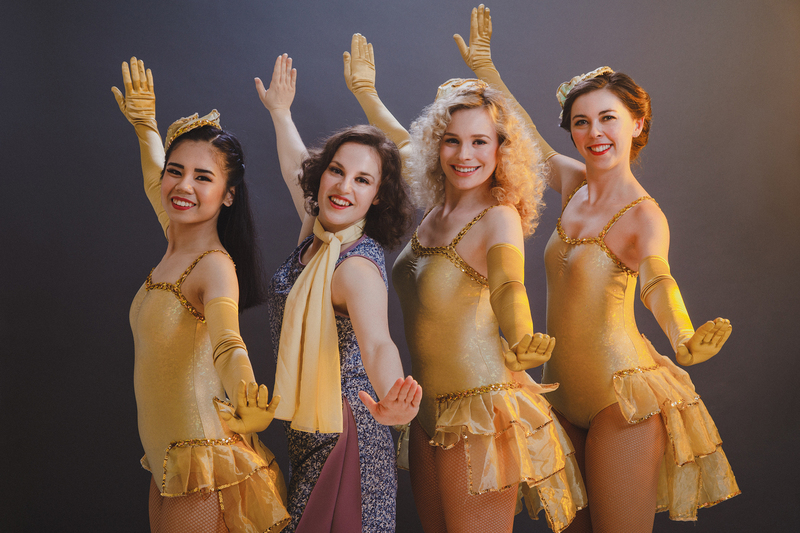 As one of the chorus girls says to the tap dancers, you’ve got all you need to cheer you up at the end of your feet! And she is certainly right, the tap numbers in this show are a lot of fun and their joy is infectious. Songs such as “We’re in the Money” and “Lullaby of Broadway” are nostalgic and stirring, and they stay with you. Brian Ball’s backstage set is wonderfully detailed and places us in the golden age of footlights, corsets, and dance-’til-you-drop rehearsals. This is a classic underdog story, and you can’t help rooting for innocent Peggy Sawyer as she gets her big break. A strong cast, beautiful set, and memorable songs make for a brilliant night of stargazing both on stage and in the sky.